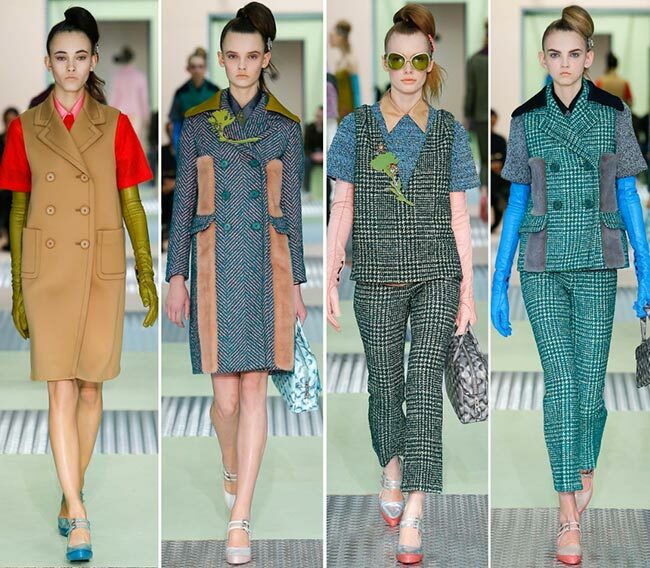 Probably one of the most colorful collections for the cold seasons is the Prada fall/winter 2015-2016 fashion line	that was revealed today on the ready to wear segment of the Milan Fashion Week runway shows. 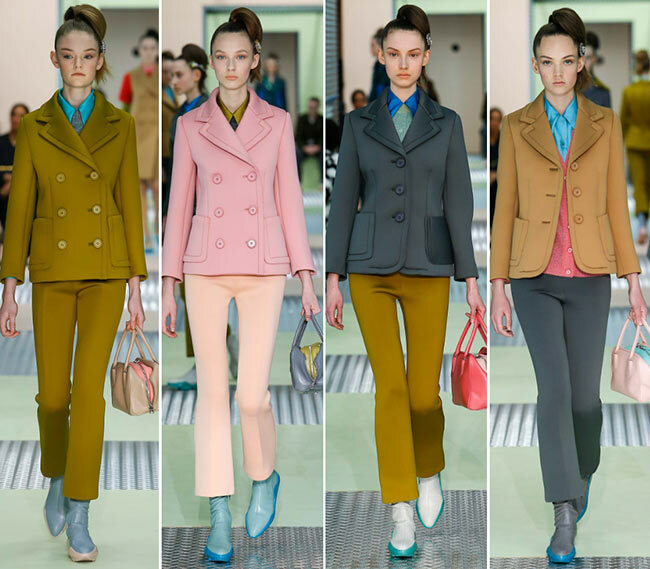 Olive green developed into baby pinks and different hues of blues, as well as camel and a touch of red, great pant suits waking it in with the gentle baby blue and pink and green hues, the purples in checked patterning coming in full force before colorful layers are given a chance to take over. Think dress over shirt over full arm’s length gloves, with a brightly colored handbag and either matching or entirely different colored shoes coming into play. 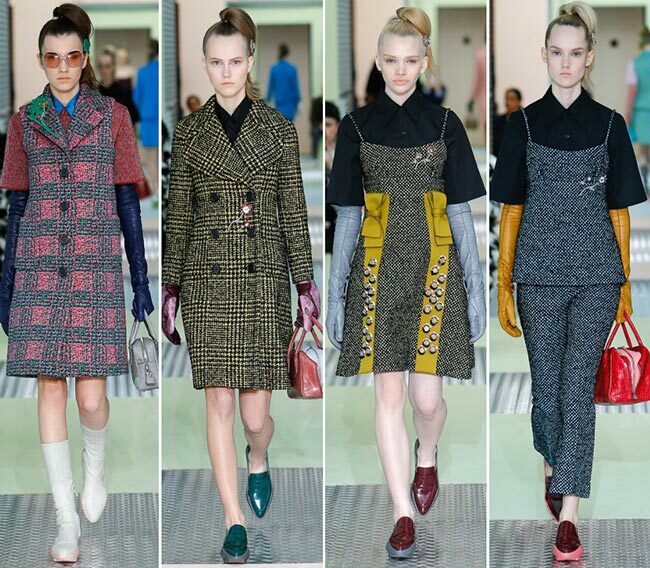 It appears among all the collections that the shoes are pointed this season, elongating the looks and having the feet appear slimmer. When it comes to the footwear, we saw quite a wide array of choices. These include baby blue boots with pink or blue soles and the same design in white and grey; we had pretty little double strapped Mary Jane low heeled shoes that brought the femininity into the looks full force, available in blues and whites with pink and blue soles, also available in light and dark greens and even gilded numbers. There were some in metallic silver as well, while others tinged on a violet hue. We have the black and the red appear towards the end as well, while all the shoes of this design took on a single color block in either bright yellow, shiny moss green, pale baby pink, white and silver. There were also boots to be seen in white and grey with baby pink and beige colored soles, while the loafers came in their own array of colors to match the rest. 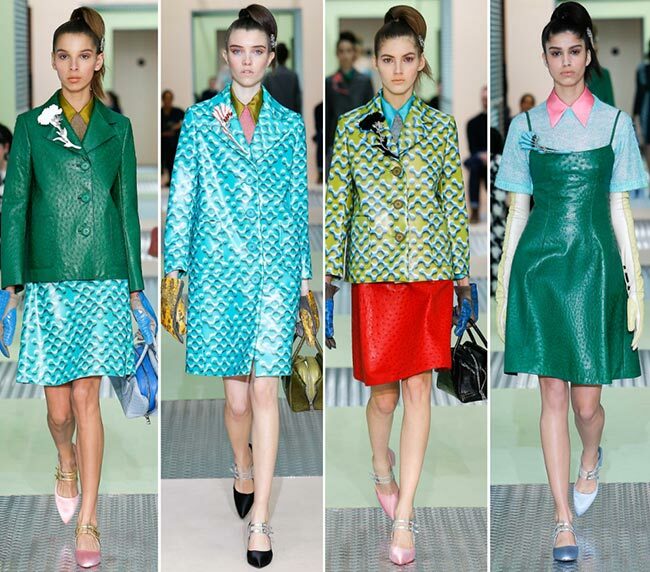 Prada is an Italian luxury fashion house and its women’s garments have long been a staple for every women’s home wardrobe, if she has the means; if not, those outlet stores provide some pieces that may be more timeless than the rest, while the knock-offs can make some convincing versions as well that most would not be able to tell were fake. The brand has been in the news quite a bit lately, with its intentions to open up shop in Vancouver making as much of a buzz as the Asian market effects on the label, particularly with the fall in spending leading to a revaluation of the house’s strategy. 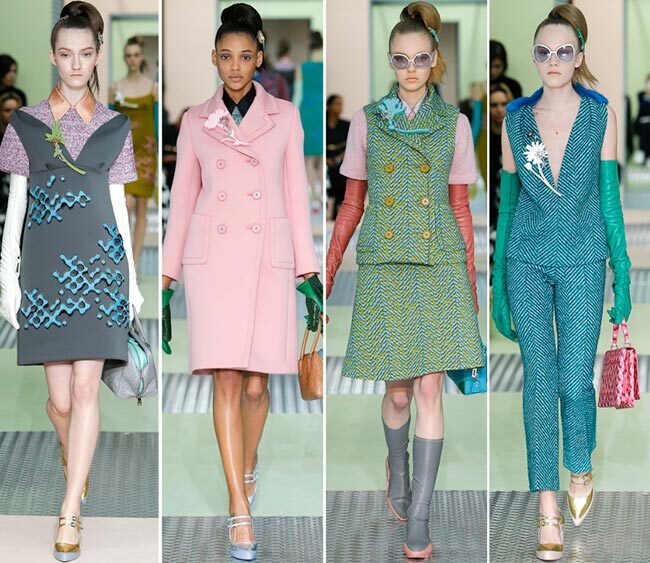 Miuccia Prada has proven that she loves to jump from fashion style to fashion style, making sharp detours along the way and leaving each collection vastly opposite from the last. 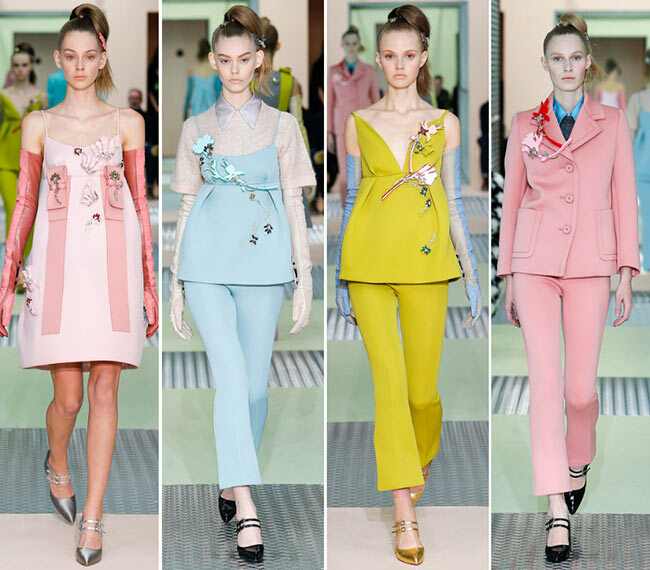 The 2015 collections were no different with the fall looking to be a long way away from spring, despite the soft, neoprene shapes in a pretty wide range of pastel hues. Furthermore, the hairstyles were entirely different, with the models sporting high ponytails with pins in them, pulled over to one side. It was interesting to see how staying warm in the winter months can be made possible with short sleeved shirts and shoulder length gloves to accompany them. There was a big play on the baby doll silhouette as well, one which we can totally see making its way into the next year’s fashion trends as well. It was certainly a collection worthy of applause and a special mention.